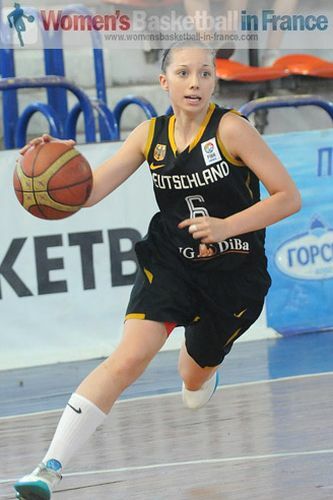 The playing schedule at the FIBA Europe U18 European Championship Women Division B for Bulgaria and Germany has worked out fine because they have already qualified for the qualifying round and will have two days rest before the second phase of the competition. However for Switzerland the only other team to have played on all three days, the going has been tough with three defeats. In Group A, Portugal have booked their place in the second round by holding off Hungary (55-54) in an exciting finish. Portugal came into the final quarter trailing by 5 points and only went in front with a three-ball by Ines Viana with just under 24 seconds left to play. Joana Soeiro then made the game safe by splitting a pair of free throws with less than 10 seconds to play. Dorottya Balla kept the suspense going with a three-ball for Hungary with less than two seconds to play. Zeljko Djokic, the Hungarian coach immediately called a time-out to draw up a play to save the game. But his players failed to inbound correctly and did not have time to shoot. In the other group game Austria beat Israel (75-57) with Sigrid Koizar scoring 16 points while Camilla Neumann added 12 points, 9 rebounds and 4 assists. With this defeat Israel are now eliminated from the title race. In Group C, Belarus moved into the second round after beating England (71-67). A trey by Ksenija Voisha with nine minutes to play put Belarus in the lead for good. England's 10 turnovers during the final quarter more or less prevented them from making up the deficit. Latvia ended Macedonia's hopes of challenging for the title with a comfortable victory (79-47). England and Latvia will meet in the deciding final group match with the winner qualifying for the qualifying round and the loser going to the classification round. In Group D, Germany secured a place in the top 8 with a hard fought victory against Ukraine (60-53). The Germans were pushed hard and had to wait until the final quarter to get on top. Trailing (47-53) at the start of the final quarter, Germany put on an aggressive zone defensive system which kept their opponents scoreless for the final ten minutes. Germany was led by Levke Brodersen (in picture) with 14 points. Montenegro turned on the turbo during the final quarter against Scotland with a 22-9 run to win their first game of the championship (66-53). Group B also have five teams and like Germany, Bulgaria were involved in their third game of the competition. They had no problems in seeing off Denmark (61-49). Borislava Hristova and Iva Kostova with 28 and 17 points respectively continue to lead the Bulgarian attack. Bulgaria are also assured a place in the qualifying round. For Switzerland the chance of a top 8 finish is over, they were beaten by Norway (54-51). Stine Austgulen led Norway with 21 points but Siri Granheim took the hero award by scoring the last 4 points to secure the win. Denmark, Finland and Norway all have one victory each and are still in the hunt for the second qualification place from this group.